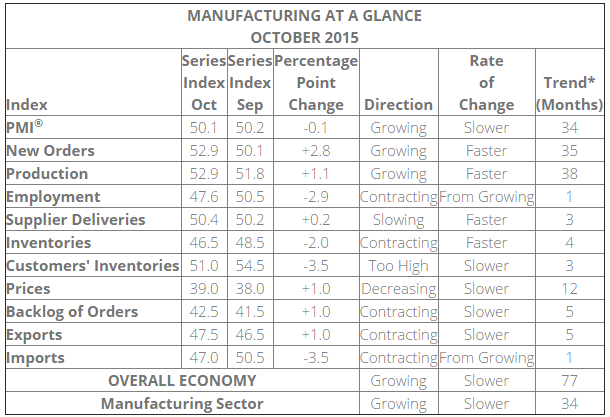 Manufacturing conditions stabilized last month as the sharp fall in commodity prices continues to work its way through the economy. Inventory levels remain mixed (see table below) with some reported as a bit “too high” and others as “too low”. Most importantly, however, the leading indicator within the Purchasing Managers’ Report (PMI)—New Orders—is providing readings that strongly suggest any remaining inventory overhangs should be worked off in short order. While we believe lower commodity prices are a boon to the economy over time, the abruptness of their price decline and a lingering “commodity super-cycle” mentality likely caught many with more commodity inventory (acquired at higher prices) than proved desirable. Adjustments are made over time and it appears the economy is close to having the initial (negative for growth) effects of lower commodity prices behind it. Sub-3% is slow growth to be sure, but what else is new? Such growth has been the hallmark of the present business expansion and remains an investment backdrop favorable for companies that can figure out how to grow at rates that separate their business performance from the corporate pack. Slow growth and economic crisis are different conditions. The Fed’s zero interest rate policy is consistent with an economic crisis. It no longer is appropriate in our estimation. Slow growth has also contributed to the general lack of accumulating excesses (debt, inflation and inventories) that make an expansion vulnerable to recession. In this context, Fed efforts to “normalize” interest rates should not prove problematic for the economy anytime soon. 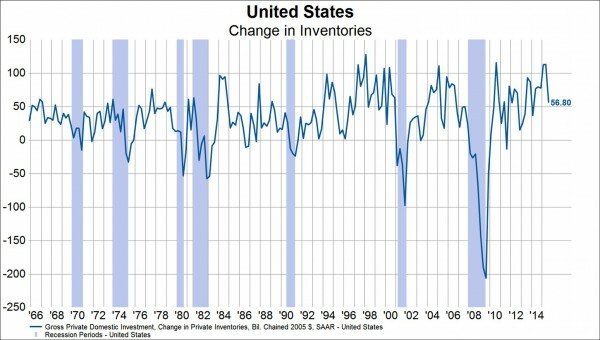 One final point regarding inventories. The current mini-inventory cycle represents common business cycle dynamics. The research firm Gavekal recently provided the following chart and commentary that puts some context around inventory “mini-cycles” within an on-going business expansion and inventory excesses that prove part of the constellation of excesses that make recessions.